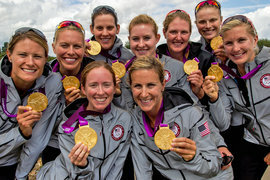 Meghan Musnicki '05 (far right) with her fellow gold-medal-winning Olympic women's eight teammates. Keep up with the Ithaca College women's crew team and other Bombers sports all year long. "It feels amazing to have won the gold," says Musnicki. "I row with an amazing group of women. We all wanted the same thing and stuck with our race plan from start to finish." Musnicki rowed crew throughout her time at IC, but her Olympic aspirations only sprang up after she graduated with a degree in psychology. For four years Musnicki has trained with the U.S. Women’s Rowing Team and has made the team roster three times, including the London 2012 Olympic Games, held this past summer. She trained six to seven days per week with her Olympic teammates and worked out two to four times each day. Musnicki says her time as an IC student prepared her for her rigorous Olympic training—and the pediatric nursing career that she plans to have follow.